The Art of Patron challenge … check! I submitted my creation, Snow Globe, Patron Style, by contest deadline but let me tell ya crafters, it wasn’t without some disasters and minor meltdowns, some involving cussing. Yes I like to do that occasionally and it feels good – sorry mom! Anywho there were hot messes far too many to yammer on about. 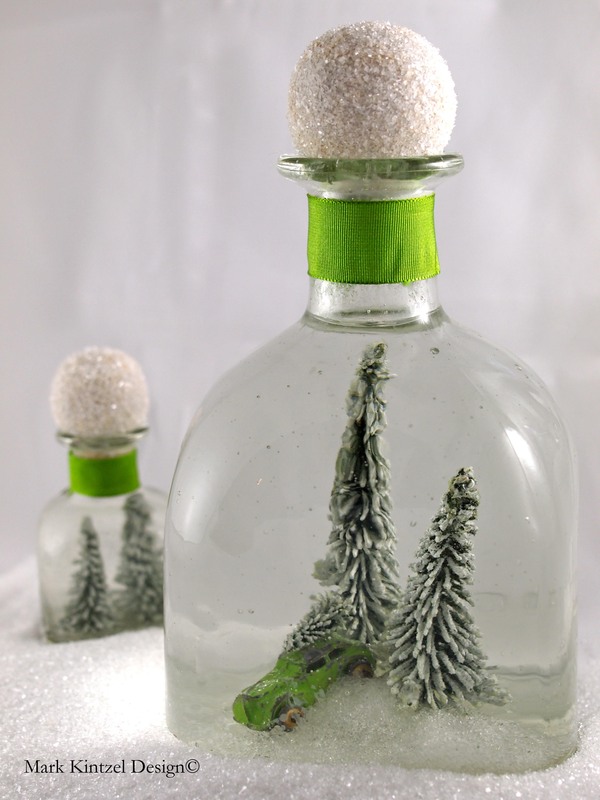 But the best was AFTER I inserted the trees, glitter, liquid, and sealed the cork I stepped back to admire my work … there it was, floating gently around the bottle with glitter swirling around its lifeless body, a tequila loving spider…&#%!@?!!!! Fast forward to a moment of silence for Mr Spider, more cussing, and a project do-over, I finished my creations. Phew! After I simmer down, I’ll share the ‘how-to’ for making YOUR own spider-free snow globe. All conflama aside, it was a fun challenge and thank you Patron for the opportunity to participate! A few weeks back, I was invited by the communications group for Patrón tequila to take a shot at being creative by entering “The Art of Patrón” contest. From now until April 30th, Patrón is hosting “The Art of Patrón,” a contest that recognizes handmade visual and functional pieces of art that contain, are made from, or depict any Patrón bottle or component thereof. Those who are 21 and older, are invited to submit original designs for a chance to win a cash prize and national exposure! I’m going to take a whirl at this challenge and I hope you will too! Simply follow this link for all of the details: www.artofpatron.com. Not only will I enjoy this challenge, I’ll enjoy emptying the bottle too….oh boy. Cheers and happy crafting!